Trade Fair Reporting - 1533300916s Webseite! Cross-media press and public relations work ensures that your company, your brand or your products will become well-known in the market. The presence in the media also prepares your target groups for subsequent advertising messages. Trade fair presentations by companies therefore provide an ideal opportunity for particularly catchy and effective marketing. Moving images in TV, Internet or social media are supporting elements, excellent multipliers of your messages and content. 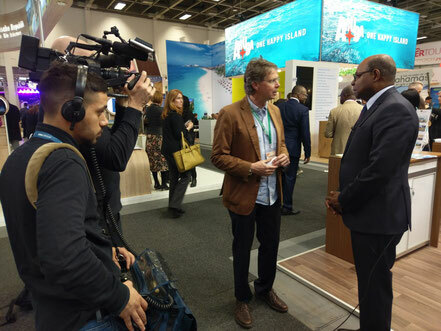 As a media company based in Berlin-Schmargendorf, blue planet tv benefits from the proximity to the exhibition center. Only a few minutes by car from the radio tower, the turned raw material can be processed, cut, synchronized and promptly provided. On the occasion of the International Tourism Exchange (ITB) from 7 - 11 March 2018, blue planet tv hosted a special broadcast of the format "Anixe on Tour" for the private broadcaster Anixe for the first time. In about 25 minutes, the presenter Beate Hoffbauer undertook a "media world tour" with stops in Tenerife, Barbados, Jamaica, South Africa, China and South Korea. The reporter of the format was Johannes Westerkamp. The program "Anixe on Tour - ITB 2018" was packed with travelogues, interviews and impressions of the various trade fair appearances. One thing is certain: Due to the positive response, this format will be produced again during the coming ITB in 2019. Above a short excerpt from the pilot show ... about the Chinese province Shaanxi.